Get your weekend playlists ready. For the latest in our best new music roundup series, we take a look back at another incredible week of music that included releases from some of music’s biggest names like The Weeknd, A$AP Rocky, Tyler, The Creator and Rich The Kid, among others. Of course, the week also saw some bizarrely impressive stuff like the Wendy’s We Beefin mixtape that not only insulted their competitors with witty lines like “4 for $4, forget the rest, 4 for $4 you gettin’ blessed,” but showcased the fast food giant’s ear for hard beats – who would’ve thought? On the note of beef, controversial rapper Lil Xan was looking to make amends with Tupac loyalists this week by performing “California Love” live at his Pomona show after calling the rap legend’s music “boring” back in February. A fan captured the entire performance and based off the reactions on social media, he might’ve made the situation worse. Check out the best music releases down below and let us know what you think. The burgeoning DIY jazz scene in South London continues to flourish, large in part to Jacob Allen, otherwise known as Puma Blue. His latest single showcases is ability to intersect downtown jazz, shoegaze and J-Dilla-esque samples. Listen in below. 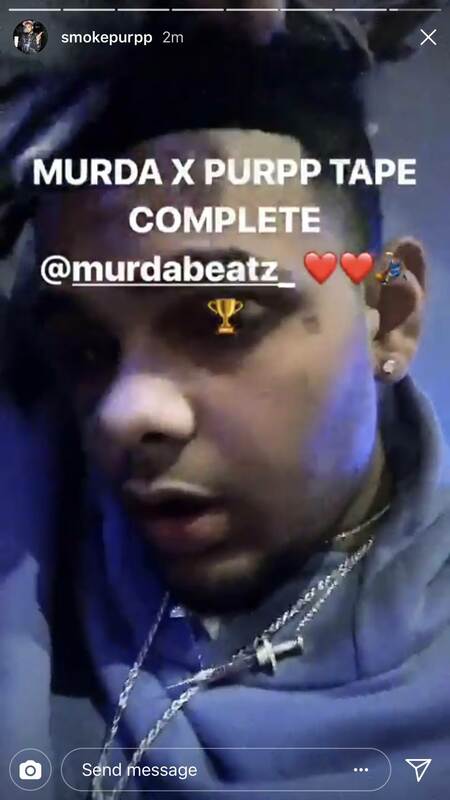 With their anticipated joint album officially complete, Smokepurpp and Murda Beatz are beginning to rollout the Bless Yo Trap singles. This week, the music duo dropped off their second album single called “Do Not Disturb.” Also featuring Lil Yachty and Offset, the track finds the trio of rap stars exchanging braggadocious wordplay over another sinister production from Murda Beatz. Check it out below and keep it locked here for the release date announcement. Duct Tape affiliate Trouble dropped his first major project this week after signing onto Mike WiLL Made-It‘s Ear Drummer Records imprint earlier this month. Coined after the Atlanta neighborhood Trouble was raised in, Edgewood is a vivid 14-tracks offering that includes collaborations with Drake, The Weeknd, Quavo, Fetty Wap, Boosie Badazz and others. Listen below. With his Lil Uzi Vert beef still fresh in the streets, Rich The Kid dropped off his long-awaited debut album this week, titled The World Is Yours. The 14-track LP features a star-studded cast that includes Lil Wayne, Future, Quavo, Offset, Chris Brown and Rick Ross amongst others. Bangers galore, stream below. BADBADNOTGOOD producer and multi-instrumentalist Matty Tavares is going solo and this week, he dropped off his first official single. Much like his work with BADBADNOTGOOD, you’ll still find cues of psychedelic pop, mixed with jazz and synth-pop textures. Nothing but pure feel-good vibes. Press play below. With no warning, Tyler, The Creator made his return this week with new surprise single and video, titled “OKRA.” Apparently the record was a “throwaway song” according to Tyler in his YouTube description, but nonetheless, we think it could’ve made the cut on Flower Boy. Press play to hear the jam below. Arguably the week’s biggest surprise comes from The Weeknd. Yesterday, the XO singer teased the project on Instagram by sharing a screenshot of a text message asking someone “should we drop Friday? I’m indifferent to be honest.” Hours later, the project would arrive in its entirety and although it’s only six songs, it nothing but pure R&B bangers. Listen below. Future’s righthand man, DJ Esco delivered his 11-song Kolorblind LP this week and as expected, the project is stacked. Collaborators include Metro Boomin, Ty Dolla $ign, Young Thug, Rich The Kid, Future, O.T. Genasis and many more. If you need some solid turn-up cuts this weekend, this is for you. Be sure to check out our previous music roundups for the best drops of weeks past. CEO Eric Peng Cheng shows off a clean summer runner. Surfacing in a brown, tan, and crimson colorway. Ty Dolla $ign Taps Gucci Mane & Quavo for "Pineapple"